Lathan Goumas - lgoumas@shawmedia.com Adam Hamler, 15, jumps during the 28th annual Autumn Ski Jump competition at the Norge Ski Club in Fox River Grove, Ill. on Saturday, Oct. 5, 2013. 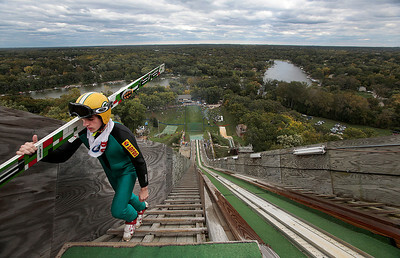 Lathan Goumas - lgoumas@shawmedia.com Cara Larson, 12, of Barrington looks back as she climbs the ski jump during the 28th annual Autumn Ski Jump competition at the Norge Ski Club in Fox River Grove, Ill. on Saturday, Oct. 5, 2013. Lathan Goumas - lgoumas@shawmedia.com Competitors walk to the base of the ski jump during the 28th annual Autumn Ski Jump competition at the Norge Ski Club in Fox River Grove, Ill. on Saturday, Oct. 5, 2013. Lathan Goumas - lgoumas@shawmedia.com Adam Hamler, 15 and Hunter Smith, 12, wait for the start of the 28th annual Autumn Ski Jump competition at the Norge Ski Club in Fox River Grove, Ill. on Saturday, Oct. 5, 2013. Lathan Goumas - lgoumas@shawmedia.com Michael Glasder jumps during the 28th annual Autumn Ski Jump competition at the Norge Ski Club in Fox River Grove, Ill. on Saturday, Oct. 5, 2013. 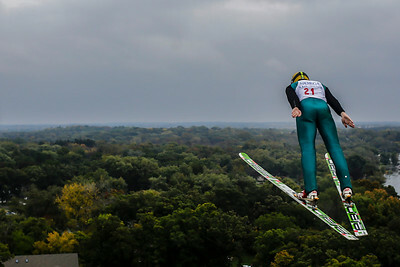 Lathan Goumas - lgoumas@shawmedia.com Competitors ride in a van to the top of the jump hill during a ski jumping competition at the Norge Ski Club in Fox River Grove, Ill. on Saturday, Oct. 5, 2013. 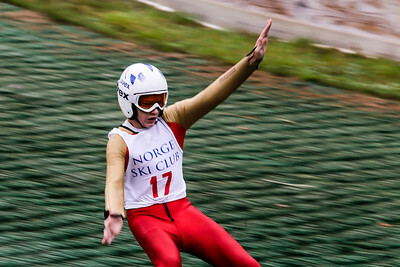 The Norge Ski Club held its 28th annual Autumn Ski Jump competition. 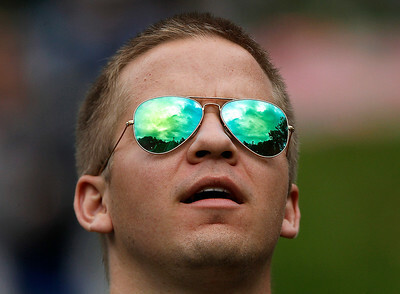 Lathan Goumas - lgoumas@shawmedia.com Robert Lock, 16, of Park City, Ut. 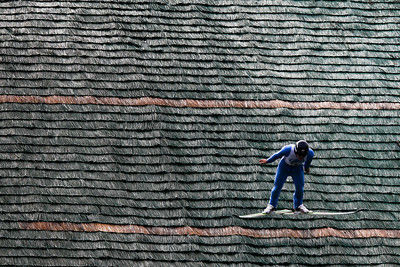 waits for a ski jump competition to start at the Norge Ski Club in Fox River Grove, Ill. on Saturday, Oct. 5, 2013. 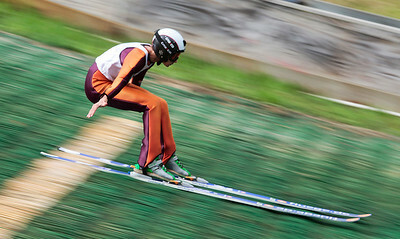 The Norge Ski Club held its 28th annual Autumn Ski Jump competition. Lathan Goumas - lgoumas@shawmedia.com Miles Lussi jumps during the 28th annual Autumn Ski Jump competition at the Norge Ski Club in Fox River Grove, Ill. on Saturday, Oct. 5, 2013. Lathan Goumas - lgoumas@shawmedia.com Brian Wallace watches as another skier jump during the 28th annual Autumn Ski Jump competition at the Norge Ski Club in Fox River Grove, Ill. on Saturday, Oct. 5, 2013. Lathan Goumas - lgoumas@shawmedia.com Jake Lock struggles to maintain his balance as he lands after a jump during the 28th annual Autumn Ski Jump at the Norge Ski Club in Fox River Grove, Ill. on Saturday, Oct. 5, 2013. 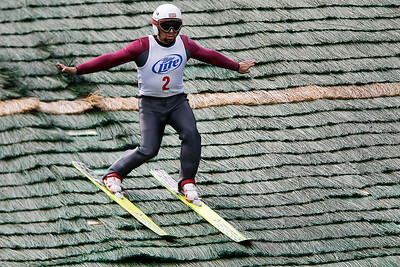 Kyle Grillot - kgrillot@shawmedia.com James Allen of Fox River Grove watches as competitors jump during the 28th annual Autumn Ski Jump competition Sunday at the Norge Ski Club in Fox River Grove. Kyle Grillot - kgrillot@shawmedia.com Adam Hamler walks up the stairs to the top of the 150-foot platform before jumping during the 28th annual Autumn Ski Jump competition Sunday at the Norge Ski Club in Fox River Grove. 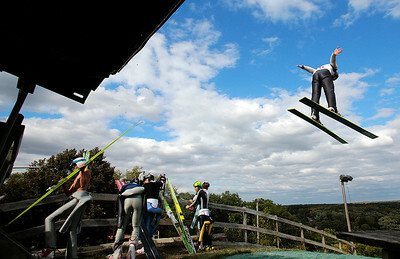 Kyle Grillot - kgrillot@shawmedia.com Judges watch as competitors jump during the 28th annual Autumn Ski Jump competition Sunday at the Norge Ski Club in Fox River Grove. 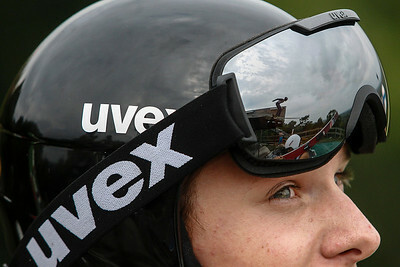 Kyle Grillot - kgrillot@shawmedia.com Landon Liveri, 12, of Lake Placid, New York waxes his skis before the start of the 28th annual Autumn Ski Jump competition Sunday at the Norge Ski Club in Fox River Grove. Kyle Grillot - kgrillot@shawmedia.com Ryan Johnson of St. Paul, Minn. jumps during the 28th annual Autumn Ski Jump competition Sunday at the Norge Ski Club in Fox River Grove. 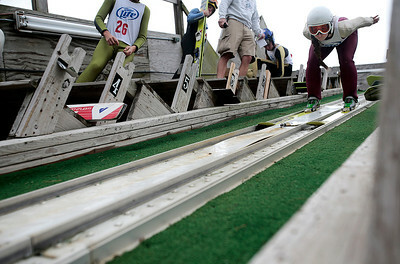 Kyle Grillot - kgrillot@shawmedia.com Casey Larson of Barrington (right) waxes his skis before the start of the 28th annual Autumn Ski Jump competition Sunday at the Norge Ski Club in Fox River Grove. 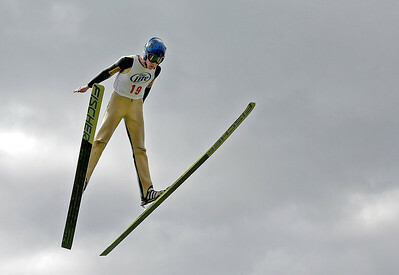 Kyle Grillot - kgrillot@shawmedia.com Patrick Gasienica of the Norge Ski Club flies past competitors during the 28th annual Autumn Ski Jump competition Sunday at the Norge Ski Club in Fox River Grove. Kyle Grillot - kgrillot@shawmedia.com Lucas Nichols, 12, waits at the top of the platform before jumping during the 28th annual Autumn Ski Jump competition Sunday at the Norge Ski Club in Fox River Grove. 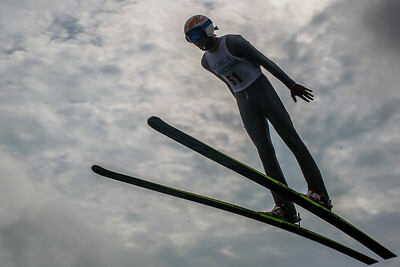 Kyle Grillot - kgrillot@shawmedia.com Sabina Gasienica takes off down the slope during the 28th annual Autumn Ski Jump competition Sunday at the Norge Ski Club in Fox River Grove. Kyle Grillot - kgrillot@shawmedia.com Tucker Hoefler, Adam Hamler, and Landon Liveri wait their turn at the top of the ski hill platform during the 28th annual Autumn Ski Jump competition Sunday at the Norge Ski Club in Fox River Grove. 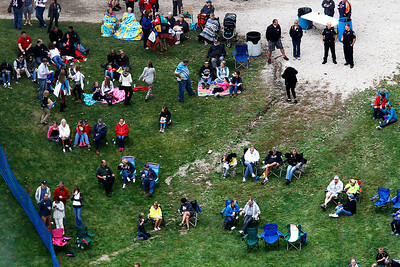 Kyle Grillot - kgrillot@shawmedia.com Spectators watch jumpers from the bottom of the hill during the 28th annual Autumn Ski Jump competition Sunday at the Norge Ski Club in Fox River Grove. 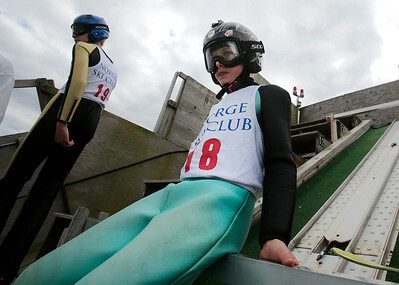 Kyle Grillot - kgrillot@shawmedia.com Tucker Hoefler waits at the top of the hill before it is his turn to jump during the 28th annual Autumn Ski Jump competition Sunday at the Norge Ski Club in Fox River Grove. 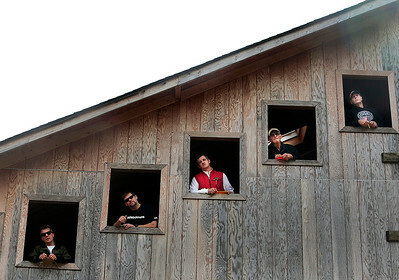 Kyle Grillot - kgrillot@shawmedia.com Landon Liveri, Patrick Gasienica, Jared Shumate, and Jake Lock wait at the bottom of the hill before being transported to the top of the hill during the 28th annual Autumn Ski Jump competition Sunday at the Norge Ski Club in Fox River Grove. Kyle Grillot - kgrillot@shawmedia.com Norge Ski Club's Ben Kaiser fights to keep control as he lands a jump during the 28th annual Autumn Ski Jump competition Sunday at the Norge Ski Club in Fox River Grove. Kyle Grillot - kgrillot@shawmedia.com the 28th annual Autumn Ski Jump competition Sunday at the Norge Ski Club in Fox River Grove. 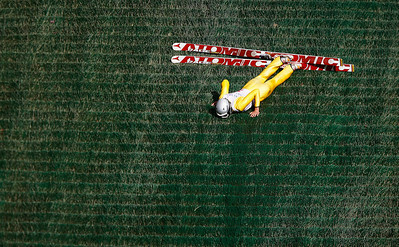 Kyle Grillot - kgrillot@shawmedia.com Karl Schultz slowly gets up after falling during the 28th annual Autumn Ski Jump competition Sunday at the Norge Ski Club in Fox River Grove. 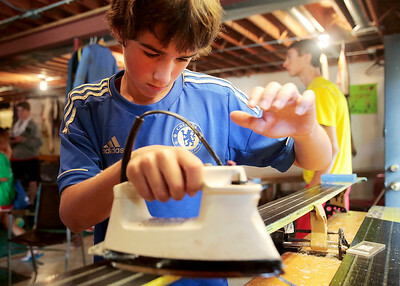 Landon Liveri, 12, of Lake Placid, New York waxes his skis before the start of the 28th annual Autumn Ski Jump competition Sunday at the Norge Ski Club in Fox River Grove.